This weekend, the Verizon IndyCar Series takes a step into the realm of new technology to enhance the fan experience. Since Spring Training at Barber Motorsports Park in mid-March, the series has been experimenting with new LED displays that will theoretically be visible to fans at the track and maybe even for television viewers. 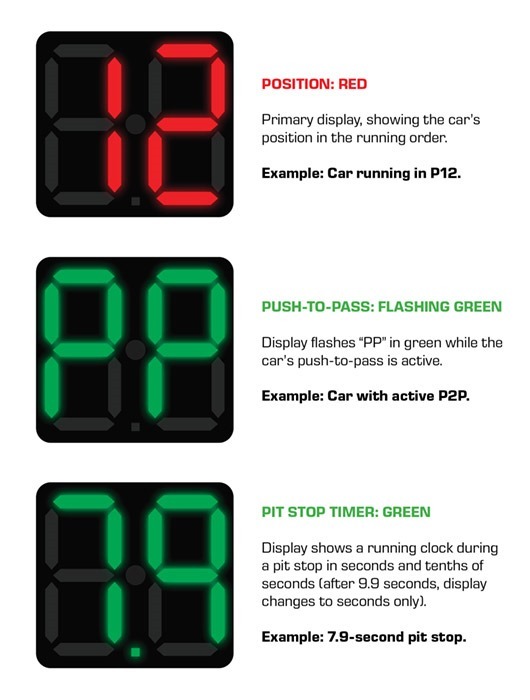 These displays are primarily designed to show a car’s race position, but will also show when a car is utilizing the “Push to Pass” (P2P) feature and even times in the pit box. The old-school curmudgeon in me says it’s a lot of nonsense and is not really something that was needed. The blogger in me who has been insistent that the series should listen to its fans, says at least they’re trying something new that many fans have been clamoring for. To me, this may be more significant than the actual technology being introduced. I don’t think I’ve seen these LED panels in person. Supposedly, they were tried in practice for the Angie’s List Grand Prix of Indianapolis. I was there for qualifying on Friday and the race on Saturday and do not recall seeing them on any cars. Perhaps they were tried in Thursday’s practice and were scrapped. I don’t know. But I do know that there were plans to have the panels on the cars for the Indianapolis 500 two weeks later, and it didn’t happen. The same plans went awry for the double-header in Detroit. Now, almost five months after they were first seen at Barber, they will finally make their debut this weekend at Mid-Ohio. Just what kept them off the cars all this time is unclear. Where there technical glitches to work through or was it just a function of having so little time to install them on the cars? As someone who watches the majority of races from my couch, I’m not planning on seeing a huge benefit as a TV viewer. So many shots are either head-on or too far back to get a good look at. Nor do I plan on getting any huge benefit at next year’s Indianapolis 500. Cars are whizzing by too fast to catch much of a glimpse of an eight-by-seven inch panel with an electronic number. Besides, from my seats I have a nice view of the scoring pylon as well as the new video boards. Where I do think this will come in handy, however, is when we make our annual trip to the Barber race next spring. We usually sit on the hill overlooking Turn Two at Barber. The temporary video screen is small and set up too far away to really get a good idea where each driver is running in the race. They have the Advance Auto Parts IndyCar Radio Network playing, but the sounds of the cars make it difficult to hear very well. The cars go rather slowly through the Turns Two and Three complex, so it will be good to be able to get an instantaneous look at where each driver stands. Systems similar to this one have been used in other road racing series. What sets this one apart is that it will update multiple times throughout a lap – every time the car passes over the embedded sensor in the track; whereas the system used in other series only updates each time the car passes over the start-finish line. The ability for fans in the stands, and other cars, to see the P2P displayed is a plus. But I guess that if the driver getting passed sees the green “PP”, the passing car is already alongside and it’s probably too late at that point to defend. Teams may be able to notify the driver that the approaching car is “on the button”, but other than that, the benefit will be to the fans. As for the pit box timer, I have my doubts who might be able to see it to get any real benefit from it. But if the technology is there and they can work it in, why not use it? As I said earlier, the crusty old race fan from the sixties in me says this is all about nothing. I’ve been going to races all my life and have gotten by just fine without a distracting electronic display on the cars. But I said the same thing when FOX first introduced the permanent info box in the corner of the screen for their NFL games in 1994. I found a box permanently placed in the corner of the screen to be a useless and intrusive gimmick. Nowadays, I cannot imagine watching a football game without those graphics. The info box (or bar) has become a vital part of every televised sport – racing included. 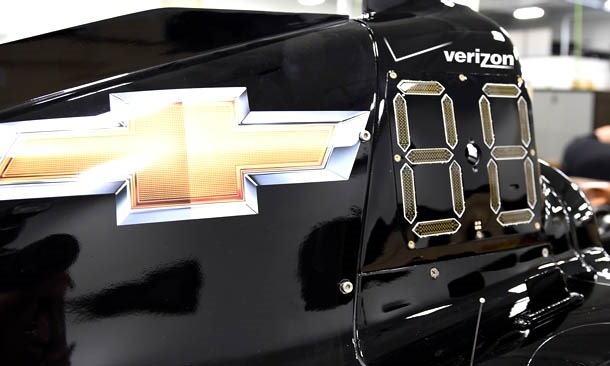 Will the LED panel in IndyCar have such an impact? Probably not, since the impact will mostly affect those at the track and will probably be most noticeable at road/street courses. Plus, very few people attend the majority of races in person. Of the sixteen races on this year’s schedule, I attended four of them with no plans to attend the final three. I have an idea, that’s probably above the norm. If I had to guess, I’d say most fans attend one to two races a year if they attend any at all. But give the Verizon IndyCar Series some credit – not only for trying something new, but for listening to and responding to the fans. Lately, it seems all I’ve done is (justifiably) criticize series management for settling for the status quo and for their bunker mentality where fans have no voice. It was never a big deal for me, but many fans have been clamoring for this feature ever since Swift Engineering proposed them in their concept design that was submitted to the ICONIC committee in 2010. Many, myself included, thought that the Swift design was one of the more aesthetically pleasing designs. Their design also resonated with many fans due to their proposed position lights. As I said, that part was not that important to me, but many liked it. It took a while, but they will finally find their way onto the cars in an actual race this weekend. Although it was not a personal ho-button topic for me, I applaud IndyCar officials for following through with something – anything, that the fans have been wanting. Is that a sign that other issues and concerns will be heard by the series? We can only hope. It’s a step in the right direction. This entry was posted on July 29, 2015 at 4:03 am and is filed under IndyCar. You can follow any responses to this entry through the RSS 2.0 feed. You can leave a response, or trackback from your own site. I found them very helpful at The 24 Hours at Daytona race. Sports car-racing fans appreciate them. For those of us who really liked the Swift Engineering car design, having IndyCar borrow these LED panels from that design is like borrowing Taylor’s lipstick from her look. It leaves us wanting more. I am looking forward to seeing them. Hopefully they will look awesome. Early reports are that the owners and drivers have no comment. Except these were used by ALMS years before the Swift proposal. The Swift proposal was larger in scope allowing a team to scroll multiple sponsor images over large portions of the car. I’m guessing that drivers will not have the option of displaying the double bird. I am indeed looking forward to seeing the displays, but with Letterman gone I now look to IndyCar and the legion of presidential candidates for comedy. Perhaps due to my twisted sense of humor, that was exactly my first thought when I read Geoge’s post today. So with their public announcement, Indycar must certainly have the highest confidence they’ll work per plan. I’m perhaps less certain and of the wait-and-see attitude as the lights aren’t a deal-maker or -breaker for me. Fine if it actually comes to fruition, but I prefer the old-school method of paying focused attention to the action and the pylon (and even a bit of the Indycar 15 app actually). Will believe it when I see it, meanwhile continue breathing at regular intervals. I think George what you said about Fox Sports’ info box in 1994 will apply to these new LED panels. In a couple years you won’t be able to imagine watching a race without them. That is my amateur armchair prediction of the day. They can also adjust the light intensity depending on the outside light conditions. Anything that enhances the fan experience, especially newbies live at the event, is a good thing. It will help the kids too. I think they will help everyone, even the die hards. They also have a high tech look to them which fits the image if IndyCar. What is interesting to me is IndyCar recently disclosed they wouldn’t reveal push to pass to anyone for fear other teams would strategize on the information but now it will be on the LED panel. Huh? I think knowing a driver is on P2P makes a difference to the fans to track because it adds an element of strategy the fans can actually see I remember one race where Will Power I think it was, had not used any P2P the whole race until the very end and he was leading. That is useful information to a fan. Pit timers are good too because if you are not at home watching on t.v, all you have are your own resources and who times pit stops? There is not enough time to keep track of everyone especially when the all come in together on a yellow. I saw them tried on a couple of cars at Indy Grand Prix practice on Thursday. They were easy to see even in bright sunlight.. It will help the casual fan, but the main benefit will be on a yellow when they should be more easily read. Worth a try. I’ve found these LED panels to be both distracting and useful in sports car racing. They can be distracting because the lights often draw my eyes away from the rest of the car and the action. However, they are especially useful in multi-hour, multi-class sports car races where leads are large and lapped cars are a majority. I do not think they will add nearly as much to an Indycar race as they do a sports car race, because the field gets much less mixed up. If I was Indycar, there are a lot of other things I would tackle before this, but that doesn’t mean they’re a bad thing. It is a genuine attempt at improving the at-track experience for fans, and I can appreciate that. They’ll be great for twisties especially. I like the power to pass indication as well. I don’t see a downside here. As George said, props to IndyCar for doing this. A similar thing was proposed as part of the chassis by Swift. I have no opinion of them now, but I will be at Mid-Ohio Sunday and am looking forward to seeing how it all works and how the cars look.